I like to eat small(ish) evening meals during the week, and something on toast is often a perfect option. This is more of an autumnal meal, but it's delicious at any time of the year. Heat a generous amount of butter in a pan until foaming and add crushed garlic. Allow the garlic to cook for a minute or two and then add thickly sliced mushrooms. Sauté until the mushrooms are browned, you don't want the mushrooms to cook for too long or they'll become water logged and tasteless. An undercooked mushroom is far better than an overcooked one. For the toast, the only rule is that you need bread that you cut yourself. Cut it thickly and toast on a griddle. Bread you buy cut is almost always not very good. When the bread is toasted, allow it to cool in a toast rack for a minute. It sounds obvious, but if you put too hot toast on a plate, the underside sweats and any crispness is lost. Poaching eggs is one of those things that a lot of people shy away from. You can do it in an egg poacher, but it's only slightly more difficult to do it properly and the results are far better. The technique I use is to get a deep pot of simmering water, add a splash of vinegar and create a whirlpool in the water using a large wooden spoon. Get the freshest egg you can and crack into a mug or small cup. Pour from the cup straight into the middle of the boiling water and simmer for three to four minutes. Use a large slotted spoon to take the egg out of the water once cooked and drain on kitchen paper. If you want to make it look pretty, you can tidy up any loose white with a knife or scissors. Serve with a light sprinkling of cayenne pepper or smoked paprika. I really like this with a black lager (or Schwarzbier). The roastiness in the beer grabs hold of the earthy, meaty mushroom and smoked paprika. 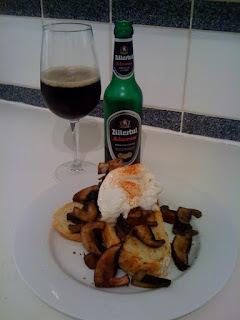 The beer is quite light in body but so is the food, together they are nicely balanced. The sweetness in the beer accentuates the lovely natural sweetness of a runny egg yolk, and the slight lager-crisp bitterness is a wonderful foil for the velvety, rich egg and mushroom. The beer in the picture above is Zillertal Schwarzes. In truth, this beer is a little too sweet and not quite roasty enough to make the pairing work. Try it with different black lagers and see how it works. I would suggest a Krusovice Schwarzbier or Brewdog Zeitgeist.